We heard back in January that the Samsung Galaxy Note 10.1 LTE would be headed to mobile carrier US cellular, the device is now available on US cellular and retails for $499.99 for the 16GB version of the tablet. The Samsung Galaxy Note 10.1 LTE comes with VoLTE support and features a 10.1 inch inch display with a resolution of 1280 x 800 pixels and it is powered by a quad core 1.4GHz Exynos 4412 processor. Other specifications on the Samsung Galaxy Note 10.1 LTE include dual cameras with a front facing 1.9 megapixel camera for video chat and a rear facing 5 megapixel camera for photos and video and it comes with 2GB of RAM and a microSD card slot. 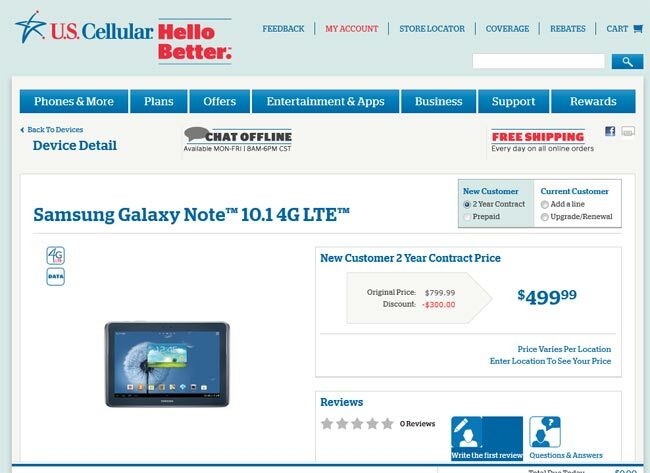 You can find out more details about the Samsung Galaxy Note 10.1 LTE over at US Cellular.